Lionel is dying to go to summer camp to try to learn more about his dad. But did his mom even sign him up, or is the joke on him waiting for a letter that will never come? Lionel has never met his dad, and his mom never talks about him, but Lionel’s magical Three-Toed-Potbellied Walbaun foot has him convinced the answers are at Camp Bonine. Lionel does get his letter during a disastrous trip to the Post Office; he’s going to camp! His excitement for camp is quickly doused when he learns he’s rooming with the biggest bully in school—Tad Winters. After being tripped, pranked, and set up by Tad, Lionel finds himself stuck doing dishes with Martha the kitchen lady. Lionel finally gets his chance to get even when the day of the big scavenger hunt arrives. The boy and girl winners get to spend the day at Lake Yellowhorn . Will Carrie win for the girls? Will Lionel beat Tad and get to go with her? Lionel will have to endure Martha, wander through the desert in the old west, find his way through the woods, escape bad guys, and collect all the items before everyone else if he wants a chance to spend the day with Carrie at Lake Yellowhorn, survive summer camp, and find out the mystery of his dad. Luckily, Lionel has his magical charm to help him out, or will it land Lionel in a mess-and-a-half he can’t get out of? Paul R. Hewlett writes books for children. His first book is Lionel's Grand Adventure: Lionel and the Golden Rule. It is an early chapter book for ages 7-10. 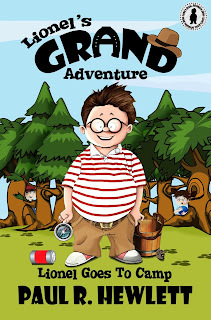 It is the first book in the Lionel's Grand Adventure series. Paul is a US Air Force vet who is married and has a "senior" dog named Joe that he and his wife adopted from the local rescue facility. His aim is to increase and foster children's interest in reading by combining entertainment and values.